One of my coworkers has an English Bulldog. We'll call her Lady. Lady is adorable, but she's also a heavy breather. The problem is, Lady thinks she's a tiny pup. She thinks she can run around with the more agile, athletic dogs without getting zonked. But after a couple minutes of hard running, Lady is down for the count. She squats in the middle of the office, splays her legs to the side, and inhales every stifled breath like it's her last. As a Bulldog, Lady isn't built to run. Her short snout and small palate obstruct her airways, making it difficult for her to breathe. Even when she's not moving, Lady sounds like she's panting excessively. But if your dog isn't a Bulldog or terrier, and they aren't getting exercise from a walk or playtime, heavy breathing could be a cause for concern. Dogs pant because they can't sweat through their skin. They can sweat through their paw pads, but that's not enough to keep their body temperatures in check. Imagine doing cardio in 80-degree weather — and while wearing a fur coat. Having uncovered feet wouldn't do much to cool you down! 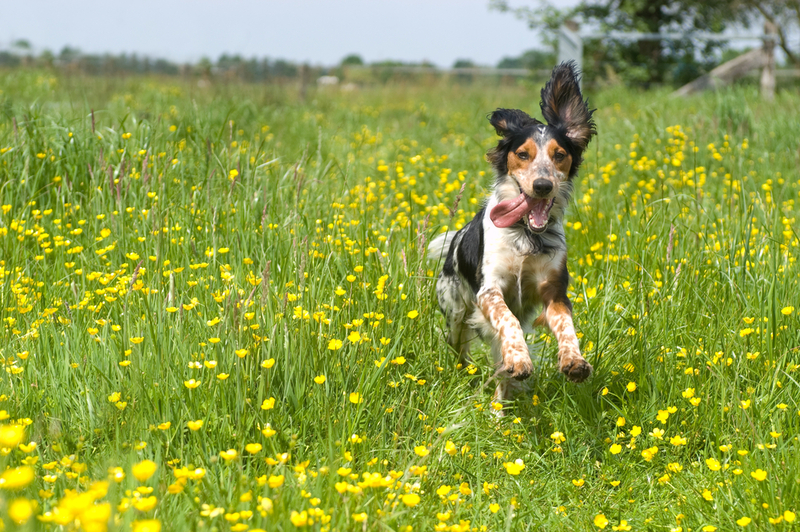 Panting circulates air through a dog's body, so heavy breathing is a normal reaction to playing catch, getting thirsty or overheated, or confronting danger. 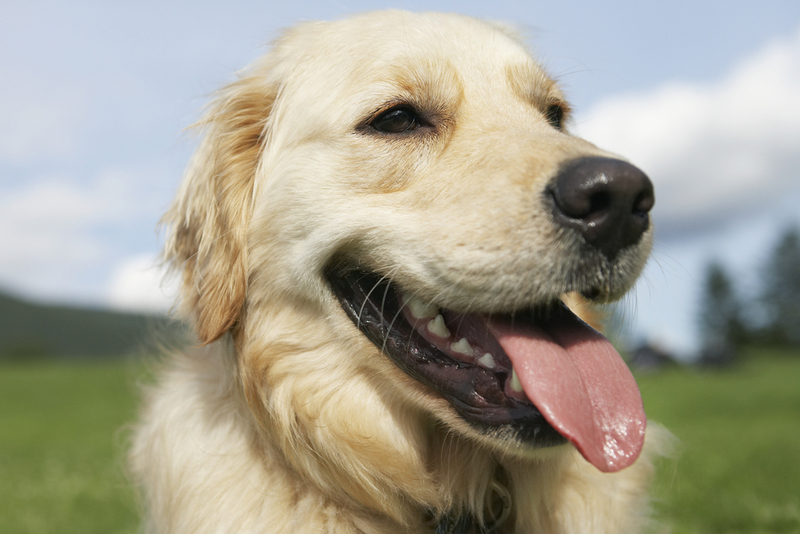 However, there are some reasons your dog's panting could be a sign of something much worse. Why Is My Dog Breathing Heavy? If it's a hot day or they've been outside for too long, rapid breathing in dogs might signal heatstroke. Besides excessive panting, your dog will show these symptoms: spiked heart rate and body temperature, glassy eyes, weakness, drooling, vomiting, diarrhea, and possible seizures. Put them in cool (not cold) water, or spray them with a hose. Is your dog breathing heavily and acting especially lethargic? Maybe vomiting? Your dog might have eaten something poisonous or had an allergic reaction. Some brand-name dog foods contain ingredients that your dog might be allergic to, so try cooking a homemade meal to see if it's the food that's making them react. If your dog's heavy breathing is accompanied by a spiked heart rate, they might be suffering from heart failure. Your pet could have developed a respiratory problem (like pneumonia or a lung tumor) or Cushing syndrome, which occurs when a dog's adrenal gland produces too much cortisol. As a reaction to Cushing syndrome, dogs can suffer from excessive hunger, thirst, hair loss, and rapid breathing. If your dog is a nursing mother, intense panting might also be a sign of eclampsia — a dangerous condition caused by low blood calcium that can cause tremors and make your dog unable to stand or walk. Dogs have incredible hearing and eyesight, so loud noises and bright flashes of light will easily startle them. If your dog senses fireworks, earthquakes, thunderstorms, or other weather changes, they might bark or pant heavily. They might even run for cover! Don't worry if your dog overreacts to what's going on outside. An increased heart rate and heavy panting is a normal response to fear. Act normal, and let them do what they need to calm down. If your dog doesn't see you panic, they'll be less likely to react. Since dogs can't vocalize when they've been hurt, panting and whimpering can be their way of telling you that they're in pain. Look for signs of pain or trauma, like restlessness, reduced appetite, enlarged pupils, or licking and biting at a specific spot. And if you have any doubts about whether they've been injured, don't hesitate to call your vet! Some medications, such as the anti-inflammatory drug prednisone, can cause excessive panting in dogs. If you notice that your dog is breathing heavily, but you don't see any symptoms of pain or illness, consult with your vet. It might be a sign that your dog needs to change their prescription. Not Sure Why Your Dog Is Panting? You can expect your dog to breathe heavily when they play at the park or get riled up by another dog. You can expect a Bulldog or some terrier breeds to pant, even when they're doing nothing. But if your dog exhibits behavior that's out of the ordinary, call your vet! Any unexplained change in their breathing or behavior could mean they're having an unhealthy reaction to a medication, illness, or injury. Do you know of other reasons why dogs pant excessively? Let us know in the comments!